Ford is famous for its effectiveness in satisfying the needs of customers that harbor a need for large transportation vehicles. It has evolved from the cruisers of the early 1970's to the more recent super duty pickups. 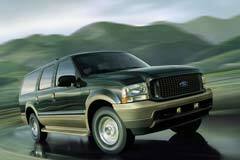 The Ford Excursion has also followed in the footsteps of its predecessors. It is a full size SUV which was manufactured between 2000 and 2005; it holds the title of being the heaviest and longest sport vehicle ever produced. The Excursion holds a seating capacity of up to 9 passengers and has an 11,000 pound towing rate. It was seen as a great vehicle for buyers with enormous hauling needs. The vehicle, however, proved a challenge when it came to parking and fuel economy. This led to a decline in sales due to the high fuel prices. Buyers looking for a used Ford Excursion vehicle should be happy if what they want is great towing capabilities and roominess. Buyers should however be ready to deal with high fuel consumption.